It tells how events in heaven have effects on earth. How there is evil in this world and it is not just the individual evil of one person and another but a sort of evil that at times seems to be a general evil affecting communities as it did in Germany during the days of Hitler. How can this be? Many people wish that we lived in a world where nothing ever goes wrong. There are never natural disasters like earthquakes and tsunamis. Where people never die young because of diseases. There are never accidents on the roads that kill and injure people. Where good people live long and wicked people die young. They never stop to think what a boring world that would be! If there were no earthquakes there would be no mountains because no part of the world would ever clash against another. If there were no diseases we would all have to know how old we would be when we would die - everyone would have to die on the afternoon of their 70th birthday! No accidents on the roads would only be if no one ever drove at more than 15 miles an hour. Everything would be carefully mapped out so that we would know in advance what was going to happen. What a terrible world to live in. God understood that so he created a world of infinite variety for us to enjoy - and sometimes make a mess of. That is what is described in these verses. There are rulers and authorities and powers in this dark world and spiritual forces of evil in the heavenly realms as Paul put it (Ephesians 6:12). They have all been triumphed over by the blood of the Lamb as our portion puts it but they are not yet all dead and buried. Many of our brothers and sisters have had to die ‘12:11. But God is in control of what happens. He has put us in this sometimes awkward world that we sometimes do not like because it doesn’t quite work the way we wish it did. Thank you Lord for this world in which we live. Thank you for all the bits we do not like. May we ever be faithful as so many of our predecessors have been. The woman, her child and the dragon. 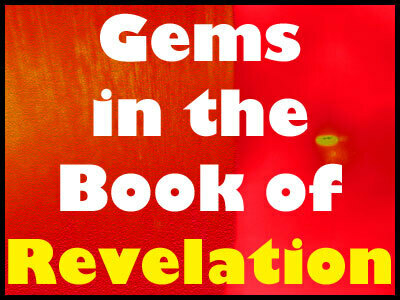 Chapters 12-14 constitute the central story of the book of Revelation and a mighty strange story it is. More even than the rest of the book, it is concerned with the context to which John was writing. It is about the small fellowships in the Roman Empire either suffering persecution or fearful that they will do so very soon. That means it is difficult for us to understand and get any good teaching out of it unless we too are under persecution or liable to be so soon. Probably the majority of you who read this are not in that situation - but some of you are. So my job is particularly difficult: to find any good things for both sets of you. But let’s see what we can do. We are seeing again, as we have done many times in this book, that all the problems of earth, particularly those affecting whole nations, are but pale reflections of the troubles there are in heaven. We see nation colliding with nation driven on by leaders who think theirs should be the greatest so that they are the greatest. It all looks very earthy. Revelation teaches us that there is another higher realm in which such things also happen. The church was under attack from the Roman authorities and the future would probably be even worse. But the church would find refuge in the wilderness, not the real wilderness, as Israel had done centuries earlier when they fled from Egypt and Pharaoh. It had been an ordeal then and it would be in the next few years but as Israel for all its struggles and weaknesses had successfully come through the wilderness to reach the Promised Land so the people of God that John was writing to would come through all their difficulties to be with the Lord eventually. And how long would it take? 1,260 days is three and a half years (with 360 days in a year - oops!). A complete period of time was seven years so this was a shortened version of what it might have been. This was an encouragement, for them, for us. Persecutions never last forever and the church often emerges from them stronger than it was when they started. That is the encouragement that you must take from these verses if you are in a part of the world where there is persecution now. If you are in a part of the world where there is no serious persecution you must pray for your brothers and sisters where there is and be prepared to give them practical aid whenever possible. The first four seals gave us an all too accurate picture of the state of the world caused mainly by the failure of mankind to resist the work of the devil. The obvious question to ask is why. Why does the Creator God not take action to stop the world; to judge mankind for its great errors and renew the world right now, without further ado. The fifth seal answers that difficult question by telling us what the view of the martyrs for their faithfulness to Jesus is. No wonder they took this position for, if the Lord God had acted sooner they would not have been martyred. So their great cry is “how long, oh Lord, how long”. They want the great judgement to begin right now and so they would be avenged. They have to wait, in the same way as in Genesis 15:16 Abraham, impatient to secure the land he had been promised, was told that he had to wait until the sins of the Amorites reached their peak and they were only then to be judged. So the martyred ones had to wait, and so do we. It is tempting to suggest that our current world has seen the zenith of the activities of the first two horsemen: the conquest by leading individuals of first one country or part of the world and then another; and in Fascism, Communism and extreme Islam the pinnacle of attempts to reorganise people at whatever cost; the height of the pressures of of famine and disease are still to come in spite of our ever increasing ability to increase crop yields and control disease. Are there still to be world-wide crop problems and mega-uncontrollable diseases still to come? We must hope not but they would fit the situation outlined here. In the meantime, before those things happen, perhaps the sixth seal is suggesting that there will be a great crash for the welfare of those who think they have it all. The picture John paints is highly symbolic. Earthquakes, eclipses of the sun, and impossible events like stars falling to earth were the way that they talked of great calamities in his day. It seems that the fear of these things was greatest amongst the rich and powerful of the world. Serve them right we may think. But it does go on to say that everyone else also panicked in the face of what seemed to be happening. Perhaps the major plus here is that they would all seem to be recognizing that these events were part of the results of the judgement of the Creator God and of the Lamb. We, like the martyred ones, have to wait in patience for God to act. He has a plan for the world. It has to descend to even more difficult situations before it will be ripe for judgement. In the same way as fruit picked too early when it is not ripe is no good so the direct action of the Triune God now would be too soon. We have to wait.